Biomass conversion lab kit for high school students. In three lessons, secondary school students investigate how biomass can be converted into useful components. The lessons on biomass Conversion consists of laboratory exercises with accompanying questions and assignments. In the lab, the students see how wood contains cellulose, and they show that cellulose in turn consists of glucose. Students are introduced to biomass in general and the development of new technologies that use biomass as feedstock for green fuels and chemicals. The course material includes a teachers manual and a student manual, which leads the students through the lessons and lab sessions. Additional questions also available for each lesson. Furthermore, Utrecht University composed an extensive practicum box that provides all practical material that is needed for the lessons. 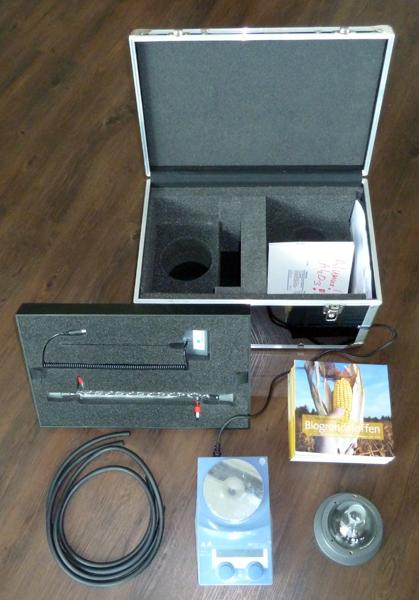 The practicum box offers sufficient material for 30 students and can be booked free of charge. Information on how to obtain the manuals and lab kit can be found at Biomassaconversie. The practicum school kit is an initiative of Utrecht University in collaboration with De Praktijk. It has made possible by donations from alumni to the lustrum campaign in honor of the 375th anniversary of Utrecht University. The aim of the campaign was to expose the general public to research conducted at Utrecht University. Through this school kit, Utrecht University and De Praktijk aim to teach secondary school students about the scientific, ethical and economic issues that are associated with the sustainable production of materials and fuels from biomass. Furthermore, students will have an interactive biomass conversion experience that will show them the fun of doing chemistry in practice.